Imagine leading a team whose service is so outstanding it becomes your brand. Your team becomes what you always knew it could be – one of a kind, defying comparison. Customers hear about you, are drawn to you, and refuse to leave you because your team is the industry Service Icon. You are one of the few leaders who no longer has to deal with the hassles of constant staff turnover, trivial customer complaints, and interpersonal staff pettiness. You and your team’s reputation for excellence spreads. What if as a manager, you no longer had to deal with people problems? 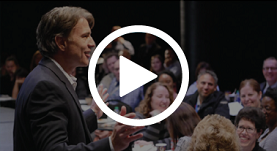 You will walk away from this seminar with a TURNKEY SYSTEM that merely takes 90 minutes a month, and creates the kind of customer service culture that’s so powerful that you become your industry’s Service Icon. When it comes to enhancing sales and service culture, Jeff Mowatt didn’t just read the book, he wrote it! This session is based on Jeff Mowatt’s best-selling business book, Becoming a Service Icon in 90 Minutes a Month. A customer service strategist and award winning speaker, Jeff heads his own training company and has written and produced 4 audio training albums. His Influence with Ease ® column has been syndicated and featured in over 200 business publications. Don’t miss this opportunity to enhance your sales and service culture – in just 90 minutes a month!